This biography consists of two books, this 344-page text version with only 40 photos and a second volume, Mark Donohue: His Life in Photographs consisting of several hundred photographs with relevant captions. 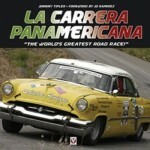 Argetsinger has written a remarkable and fitting tribute to one of America’s greatest race drivers. That it has already won several awards including the prestigious International Automotive Media Award is no surprise; Argetsinger’s previous work, Walt Hansgen: His Life and the History of Post War American Road Racing was similarly praised and feted in 2006. This is a significant book fully worthy of the IAMAs. In a full-time effort that required more than three years to complete, Argetsinger interviewed over 211 people close to the subject, and enjoyed not only access to all the family papers but those of the Penske organization as well. He also had access to the unpublished tapes made for Donohue’s own book The Unfair Advantage. 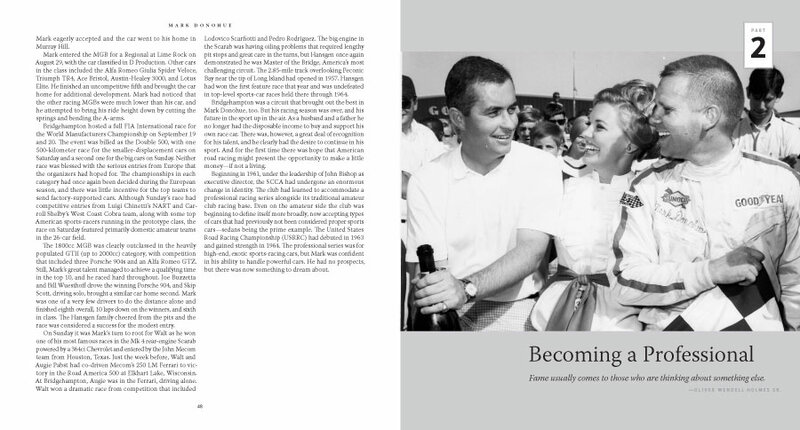 In fact, his approach to the Donohue biography is much like that of the Donohue/Penske approach to racing—a total commitment, the pursuit of perfection, and a successful outcome a done deal even before the checkered flag. “Although I hadn’t thought of it that way,” said Argetsinger in a phone interview, “but I always had in mind that if I did this book, I would have to do it in a manner that Donohue would have appreciated.” Argetsinger knew that it HAD to be good; anything less that the best would not have been par for the course. 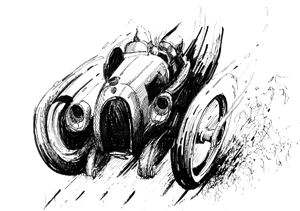 Carl Goodwin, an excellent automotive writer on his own and a member of the IAMA board, said that Argetsinger used Donohue as the focal point but “used such a broad brush that the book ends up being a chronicle of sportscar racing in America during one of the most interesting (and dangerous) eras in motorsports history.” Since drivers of that era were truly multi-taskers, the book covers a wide variety of racing: SCCA production racing with an Elva Courier; early years of Formula Junior with an Elva; Formula Libre with a Cooper-Offy, Trans Am racing with a Mustang, Camaro and AMC, Can Am with a Lola, McLaren and Porsche, Le Mans with Ford GTs, Sebring with a Ferrari 512M, the Indianapolis 500 (where he won in 1972), and finally, Formula One with the Penske PC1 and March 751. The book gains in strength as Donohue grows and his circle of friend increases, until by the end, you felt like you’ve been a part of the race team. The depth of the research is amazing. On the surface, this could be seen a merely a blow by blow recounting of each of the races Donohue participated in from 1960 to 1975, similar to almost every other race/bio book ever written. But with Argetsinger, the events read as if he was actually at each race, behind the scenes with the crew, taking notes and recordings, and talking with family members. 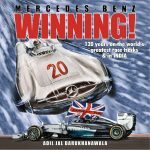 He writes about the car, the garages, the trips, the incidents, the anecdotes, the jokes, the problems, the failures and successes at each event, not only in relation to the Penske team but to the direct and often indirect competitors, such as the brutally competitive Parnelli Jones Mustang team or Dan Gurney’s AAR. He gets as much out of the remnants of the opposing team members as he does Penske’s and compares notes. There are also two sides to every story and “Captain Nice” (why do they call me that, Donohue wondered, “I always heard nice guys finish last.”) was not always in the right lane. Although the account is usually tipped toward Donohue and the Penske team, feuds with Parnelli Jones and Pedro Rodriquez (a personal friend of Argetsinger’s) and Peter Revson are told from as many sides as possible. Argetsinger goes well beyond what is necessary; he is a master of telling the story of American road racing, weaving in the politics of the SCCA amateur vs. pro battles, the rise and fall of the Can Am series, Indianapolis rookie trials, and the financial failures of the big tracks like the ill fated Ontario Motor Speedway. Darkly, the constant presence of death—almost unknown in today’s racing—is handled with understanding and taste. But the toll was tremendous and eventually included Donohue himself. Argetsinger leaves no wheel unturned in a relentless and gratifyingly complete attempt to get the record straight. 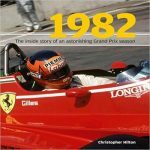 It is this superb attention to detail and commitment to excellence that puts this book far, far above the average race driver’s bio. Donohue would have been pleased. On the downside, any book of this length can get tedious. Fortunately Argetsinger’s writing skills keep the interest up, and one is eager to find out what happened at the next event and further. But it is long, and is not an overnight read by any means. That this vast amount of words is livened up by only a few photos is obviously noticeable and it would have been helpful if the reader were told that a companion photo book exists. Notes and bibliographies are missing. The book is packed with first-person quotes—we can assume that when Argetsinger does not attribute a quote to any other source it defaults to his own interviews, letters, or emails to the individual quoted. Argetsinger discussed this with the publisher David Bull and it was decided that since in almost every case the quote in question was attributed in the text or acknowledgements, there was little need for further documentation. As historian Michael Lynch says, “It’s unfortunate that documentation standards have lapsed, but realizing the low-volume sales of automotive biographies, we are very lucky to have the Donohue book in any event, with or without footnotes.” Still, a book properly documented will have a much longer shelf life than one that doesn’t. Offsetting this is a comprehensive list of interviews in the Acknowledgements section, a full and useful 24-page Index, and Donohue Race Results by Year appendix. At this low price the book is an outstanding value and a must-have for any student of racing history. 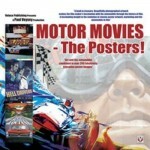 Won International Automotive Media Award: Best Book of 2009.